Having covered Team Sky’s budget the other day, here’s a closer look at the team budget of Ag2r La Mondiale, the French team in the World Tour sponsored by one of France’s largest mutual insurance firms and one that is about to get even bigger. That’s a grab of the accounts filed with the court clerk in Chambéry, the Alpine town where the team has its HQ and you can see the budget for 2017 for €16,846,389. Again it’s 2017 and not this year, these are from the team’s accounts for the year ending December 2017 which are then compiled, audited and filed… and a reader kindly emails a copy over. The entire wage bill for the team is €8.75 million on top of which is added €2.88 million of “social charges”, French jargon for payroll taxes. As we saw with Team Sky’s accounts the British team doesn’t have riders as employees but hire them as contractors or service providers but in France it’s the law that riders must be employees and on top of this come the French payroll taxes which equate to 33% of the wage bill to be met on top. This means if Ag2r want to match a salary offered by some other teams when bidding for a rider then if they hire them they have to budget a third again on top in taxes. It shows that simply imposing a budget cap in isolation could close the gap but it won’t level team finances. As this team publishes the accounts annually we can trace the budget over recent years and the chart above shows a compound growth rate of 10.8%. The team has grown its spending but the World Tour as a whole has seen budgets swell far beyond inflation and for all the “the sport is broken” chants, there’s always more money coming into the sport and this team are no exception. What is different here is the sponsor is onboard until at least 2020 and this security has enabled them to offer several riders long term deals. This isn’t a big budget team, as we can see the team’s budget is less than half that of Team Sky. But it has delivered repeat podium places in the Tour de France with Jean-Christope Péraud and Romain Bardet and had podium finishes in the Monuments with Silvan Dillier Paris-Roubaix. Whether by design or chance the team has made some clever hires in recent years with Oliver Naesen who is capable of a big win in the spring classics and then worth his weight in gold as a bodyguard during the Tour de France, a role he seems to relish when other Flandriens might be on the beach in the summer; a similar story with Silvan Dillier who has brought expertise and experience from BMC’s team time trial prowess to the team. They also have a productive feeder team, CCF Chambéry that supplies them with a conveyor belt of talent including Bardet, Dillier and Pierre Latour. One thing missing is a sprinter: Ag2r are one of the few teams without an obvious house sprinter and it shows given they’ve only had 14 wins this season. Ag2r La Mondiale is a mutually-owned social insurance company in France offering pension plans, health insurance and suchlike and is the market leader in several categories in France. It’s merging with Matmut, another mutual insurance company which is orientated more towards accident, motoring and household insurance (note French rivals Groupama-FDJ have Groupama, another mutual insurance giant as their title sponsor too.). The merger is expected to go through on 1 January 2019 and could well see the enlarged group take on a new name with fresh branding. Who knows, maybe the brown shorts could be designed away? If only this blog could cover every pro team’s set of accounts it would but, alas, only Ag2r and Sky file theirs for now although we might see Groupama-FDJ file theirs given the team used to be a subsidiary of FDJ but is now a joint 50-50 entity between the two sponsors. But for now that seems to be all we can get, all team have accounts of course and team budgets are audited by the UCI but it’s private and were they to be public it’d show they’re all on the up. Ag2r’s budget is up again and this time by 10% reflecting the general trend in rising team budgets. Just a quick note: “podium finishes in the Monuments with Silvan Dillier in Ag2r La Mondiale” was probably meant to say Paris-Roubaix? I’m sure the OP knew that Paris-Roubaix is a monument, and was therefore suggesting it should read “podium finishes in the Monuments with Silvan Dillier in Paris-Roubaix”. Stating the team name again is tautologous. Got it, thanks. All corrections welcome. This comment will self-destruct later. Such massive disparity in finances doesn’t lead to good sport, despite what those who think that money is all-important will say. Sky win the races they really want to win (i.e. the Tour and sometimes other GTs) almost with a grim inevitability. As a contest the Tour is over before it begins: the Sky train wins – sometimes with a superior rider (Froome), but even with relatively mediocre (i.e. they’re top-5 riders, in terms of GTs) riders (Wiggins, Thomas). This is a frequently repeated and emotionally compelling argument. There are clearly advantages in having a big budget but the idea that big budget = lots of wins isn’t supported by the facts. BMC and Quickstep for two contrasting examples. It seems to me that Team Sky have hit a rare sweet spot of favourable circumstances, partly through serendipity and partly through clear thinking, and have been clever in exploiting them. An already existing, experienced and innovative coaching team, a clearly defined focus and a supportive, deep-pocketed sponsor whose interests align with the focus of the team seem to me to be the main factors. As far as I can see, there is nothing stopping other teams following a similar route although they might have to work a bit harder at pulling it all together. Whilst there is plenty one can criticise about Team Sky, I can’t understand the desire to demonise them because of their success. And similar to the BMC/Quickstep argument, is the fact that Sky, generally over their lifetime, aren’t anywhere near as succesful in other races as they are in the TdF. They’re not really interested in Monuments. Their money is spent on uber-domestiques for GTs – even riders who are ‘classics’ riders are converted into u-d’s. That’s not entirely accurate. Both Sky and Ag2r spent within a percentage point the same on wages compared to their overall budget so Sky spend (or more importantly account) for more spending in equipment etc. People need to also remember the accountants at Sky don’t want to make a profit. So if Sky are spending twice as much on equipment as Ag2r, is that a fair reflection? I doubt it. I worked out a few years ago when Sky had a line by line budget that they used the RRP for their equipment even though most of it is free as far as being from a sponsor. If Ag2r are ‘spending’ half the amount as Sky, logic says that it’s the accounting practices that are different, not that Sky have twice as many of everything as Ag2r. It’s perfectly obvious, Larrick, that Sky are spending far more on rider wages than AG2R are. You only have to look at their roster. I have a great deal more belief in what I can see with my own eyes that I do in accounting practices. I think you need to reread what was written J Anon. Obviously sky spend more on wages. What do you think it means if one has a budget twice the size but the percentages are the same? If you’re fixated on Sky though I suppose you’ll miss the point. I’ll try again just for you. It wasn’t about Sky per se. If the majority of costs (fuel, hotels, equipment etc) are similar no matter what the budget, how is that both teams are spending the same on salaries percentage wise? It effectively mean that Sky spend twice as much on ancillary costs which of course doesn’t make sense. 50% more would even be a stretch. So I was pointing that out and proposing that it was partly due to Sky making sure they ran the team at a small profit, at the very best, and that Ag2r didn’t put the same value to equipment received from sponsors that Sky do. In other words, even if Sky spent twice as much on their riders, their budget wouldn’t be twice the size in real terms unless every other cost averaged out at double too. Obviously I’m not here to support Anonymous’s point (which sounds very like something J Evans would say) but they do say that Sky “win the races they really want to win” rather than “Sky win all races”. That’s because, of course, Sky don’t win all races. After 9 years of existence there are big races Sky have never won or podiumed in. Moneybags Sky are, like everyone else, also far behind Quickstep in the number of wins category and they don’t build teams, it seems, to amass a quantity of wins either. They are more interested in the quality of them which means, first and foremost, dominating the Tour followed by picking up other grand tour wins. If they happen to bag a monument as well (only 2 of the 5 so far) all well and good and any other races are a bonus. In the context of budgets, though, the pertinent question is what money can buy you in cycling. It can buy you good cyclists, of course, but it can’t stop them crashing or getting ill. Is “Crash Froome” still a thing? His multi-million salary didn’t help him much in the Tour 2014 or Vuelta 2015. The “Skybots” and their bulging pay packets didn’t stop the whole team getting mugged on stage 15 of Vuelta 2016, a stage which now makes me shiver at the word “Formigal”. So, at most, you can say money gives you a good chance of success. But it doesn’t guarantee it. It certainly doesn’t buy it. If it did Sky’s win percentage would be much higher and the winning across the whole peloton should show some correlation to budget. Yet it doesn’t. Why do Quickstep, with a budget likely much nearer AG2R’s than Sky’s win disproportionately more than their budgetary competitors? It can only be down to their priorities, rider choices, luck in races, tactics, etc. Correlation to money, I suggest, is much less obvious or even apparent. So too with the French team here. No sprinter. Relying on Bardet alone really, supported by Latour, for anything big. That was their choice with their money and, as can be seen, it puts them on the top step quite rarely. So my advice is this. Don’t merely concentrate on how much money in total. Ask what is done with it. Think a little harder about it. Exactly. Money has hardly bought Katusha many victories this year. Judging by the riders they have, the likes of BMC and Katusha are not spending anything like what Sky are spending. That always reads like an excuse. Look at Katusha’s roster: nothing like the domestiques that Sky have. Do BMC and QS spend anywhere near as much as Sky? I’m pretty sure QS don’t. As for the other reasons for Sky’s success, the reasons you give are even more unproven than any doping allegations. I don’t know how anyone can say whether the link between budgets and success is supported by the facts: we simply don’t know enough about the different teams’ budgets to say. But there is a very clear correlation between budget size and success in every team sport for which those figures do exist, and it would be passing strange if cycling were immune. Even based on what we do know, it’s hard to make that case. While Sky may have fewer wins than QS, they’re still in a clear 2nd place this season, having won the races that they “really want to win”. Great comment Alan. I’m no Sky fan, but people really get bothered by them. CF and GT would have likely won those TdF’s if they had been on other teams and had trained as hard. Gotta whole heartedly disagree with that. The Sky method played a massive part in all their wins. Froome was nobody before he went to Sky. The reality is Sky took a guy who had showed ability but for a mulitiple of reasons wasn’t making the best of it so I agree Sky played a massive part in his development but he wasn’t a nobody was he? Unless you’re saying Sky thought, let’s hire someone we believe has no talent and turn them into a multiple GT winner because that’s easier than hiring someone with talent and doing the same…?? They were about to drop him pre-2011 Vuelta, though. Is that factual or an assumption? He had spent the season working as a domestique and out performed Wiggins at Romandie. He hadn’t raced the Nats but the year before was second to Wiggins in the ITT. Sky needed/wanted to grow the British licenced riders so he was always likely to get an extension especially as they obviously believed that he was suffering still with the effects of Bilharzia and they knew what numbers he could put out. It’s possible that a poor Vuelta might have meant he was let go but I don’t think it was a certainty. Fair enough. I think the point stands. They saw something in him (mainly the numbers when they tested him I assume). In comparison to Europe, he was late into the pro peloton too. I was going to say that maybe now Sky would be more ruthless now but then Inxausti was given a year extension after hardly racing for two years last season. Maybe the anecdotal came from different people surmising…?? I believe the story about Team Sky being on the verge of letting Chris Froom go in 20§11 stems from the interview Dave Brailford gave in which an approximation or an interpretation of a “rider development graph” he drew on a napkin. The dot representing CF was famously in the area that apuit him among the riders Brailford described as “borderline for us”. You can rather easily find the interview and the graph on the net if you are interested. I think Froome’s autobiography also suggests that his agent was finding it difficult to get a contract renewal offer out of Sky before the 2011 Vuelta. For Froome at the Giro at least, don’t think he can win on any other team. He’d loose much more time when undercooked during first half of the race. He would also need to dispense much more energy to launch his 80km raid. After all, it’s Sky’s pace making not Froome’s own acceleration that dislodged most other GC contenders (maybe the last part of dislodging Doumoulin was Froome’s own doing. But then again it was against a Doumoulin weakened by Sky pace making). A disclaimer here. I am a Froome fan and I think it was a great feat. But I honestly don’t think he can pull it on any other team. If Bardet won the Tour and I called him “relatively mediocre” several denizens of this parish would pour scorn on me. So is Thomas really “relatively mediocre” or was he just a guy in the right place at the right time racing against two better riders, one Dutch and one a team mate, who had just done the Giro? If they hadn’t done the Giro I think both would have beaten Thomas but he still would have come third and that’s enough to have people on this blog saying how great Bardet is. 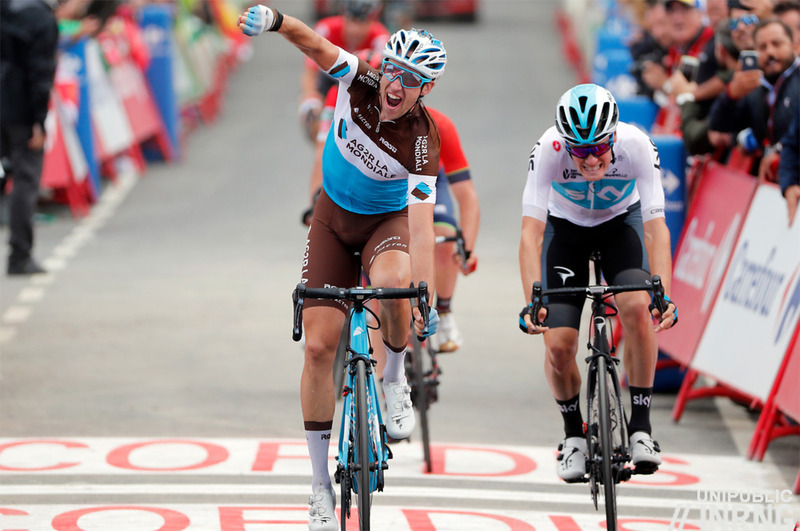 But what’s good for the Bardet is good for the Thomas and Thomas, unlike Bardet, has won both one week and and three week world tour stage races. And he’s beaten the likes of Contador, Dumoulin and Froome to do it. And I’m not even sure, in the context of this particular blog, that money had much to do with it. On the Col du Portet, for example, Bardet blew long before the summit and he would have lost the race that day anyway and that before I mention the shibboleth of time trialling skills. In terms of TdF winners, Wiggins and Thomas are ‘relatively mediocre’. As would Bardet be. As were some previous winners, e.g. Sastre. My point is essentially that if you gave many of this year’s (or any other year’s) TdF top ten finishers the full backing of Team Sky, they’d probably have won. For a neutral, that makes the TdF fairly tedious. Podium maybe, but not top 10. Also only those that can TT. Not sure Sky can win with Bardet or Pozzovivo. could possibly work with Pinot. On an interesting side note, Landa really improved his TT at Sky. Landa, Quintana, Roglic, Pinot, Kruijswick, Yates, Bardet, Dumoulin… all depending on form, but I don’t see any of those riders as being inferior to Thomas and were they Sky’s rider for the TdF I’d fancy them to win. What a ridiculous point to make obviously talking about mediocre with regards to the professional peleton so basically top 20 grand tour riders in the world rather than top 5. For some, Grand Tour winners are a different spices. They only compare amongst themselves. I think the picture is somewhat distorted by Froome, he’s 34 next year and unless he can find the secret Horner and Valverde’s ability to defeat aging then is probably past his peak. It could easily be that post-Froome they drop pack into the pack. Both the Giro and the Vuelta, in different ways, showed that the key factor seems to be Froome, not the Sky train. The Tour, on the other hand, showed the key factor to be the Sky train. If Bernal doesn’t grasp Froome’s oft-predicted wilting baton (giggidy) then Sky will buy someone else who can. Why wouldn’t they? Bernal does look like he has the ability to replace Froome but a lot of riders have looked like future GT winners in their early career and never managed it. Same with buying someone in – no shortage of riders who have been bought in by teams looking to pick up the next big thing and ended up being solid top ten GT riders at best. Sky will likely keep trying, and spend a fair bit doing so if they can but it is a long way to a sure thing… and if they have the money still without James Murdoch controlling the Sky purse strings. And, right on cue, Sky confirm Bernal on a new 5 year contract which will likely net him the substantial part of AG2R’s yearly budget for ALL their riders over a given year. Perspective. Apart from some high profile failures (Formigal being the obvious and oft quoted example) team sky have been very good tactically in recent years. perhaps they are able to play a card that other teams cannot but I think that comes down to team selection, luck, training etc. 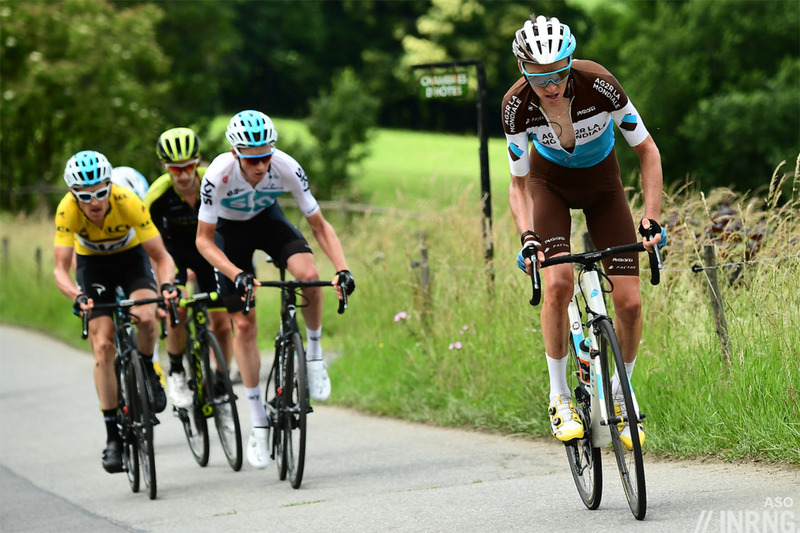 It was telling that when AG2R tried to pack their tour team with climbers in 2017, they were unable to emulate the sky train in the mountains (admittedly in a race with fewer mountain top finishes, but still they failed at sky’s game) to a great enough extent to discommode froome. and ultimately the sky train only works if your last man is better than the other team’s ‘last’ man (paraphrasing dumoulin). one thing the sky train does is to prevent (or reduce the likelihood of) attacks and means there should be smaller gaps at the top of a climb. small gaps in the high mountains mean a greater benefit to the ITTers and this is where most, if not all of Sky’s tours have been won. we shoudn’t forget that Wiggins, Froome and Thomas are amazing on a TT bike – that’s no accident. it’s the race of truth for a reason. Where money does come into it is of course salary, attracting great riders, but also training. I recall reading earlier this year that team sunweb could not train in the Canary Islands because literally every hotel was booked for the period they wanted. and guess which team had an enormous training camp there at that time? Of course Sky, but they also had obviously had the foresight to book it out before sunweb did. perhaps they pay their backroom staff better too. The team sponsored by a travel agency didn’t book its hotel early enough? And it was Bahrain that had booked the hotel out. Facts… good story etc etc. Isn’t this cancelled out by the benefits of being a employee rather an independent contractor? I assume that especially disability benefits are very attractive for professional cyclists and almost uninsurable privately. I don’t know about France but I doubt it is much different to the UK, where if you are paid by a freelance contract, you as a freelancer have to pay the social security costs yourself. It is quite a complex area and there are certainly advantages to doing things this way which is why so many people do it, but it certainly doesn’t give you anything like 33% savings. Once you get to a certain level of money, as a freelancer you can start to work the numbers a bit more flexible in a lot of countries. You could create your own company and be an employee for that, suddenly things get a lot more pliable in respect to taxes for example. For cyclists there’s also the split between salary and image rights which can sometimes mean different taxes. It used to be that some top riders had shell companies in Luxembourg for their rights income (endorsements etc). It’s harder for French riders and note that they choose to live in France, rather than move to Switzerland or Andorra. How different are social taxes in France from other countries? Here is Russia they are 30.4% and I seem to recall a similar figure in the UK. The only difference is the ability to be self employed and cheat the system, something that can come back to bite you, especially for a sportsman with a limited working life. Save the brown shorts! Always useful on certain types of jours sans. I really hope they’re not spending their money on those hideous sunglasses. C’mon, it’s a racing team. Rule #1 Free stuff is the best stuff. Rule #2 Free stuff + money is even better. Same as it ever was. I wonder what percentage of the cycling equipment used by WT teams is actually purchased (even at a bro deal) each season? 10-20%? Probably less. I hope they get huge discounts on a wide variety of insurance products too. It looks like salary costs match up to only just over half the total revenue: this seems a little short as a fraction. Could you break down the rest of the major blocks of cost? Bikes. Logistics, vehicles, depreciation etc. all add up but I’m surprised, especially since smaller teams have similar logistical and material requirements. Sprinter is Sam Doumalin ? Not so much these days, more a road captain. He’s also the son in law of team boss Vincent Lavenu and likely to retire soon. Love this comment! They say money can’t buy you LOVE. At least I am no big fan of many big teams, better keep this to myself. But a lot of respect to French riders! Then between Factor and Focus bikes, too short a time to establish any kind of favour may I say. Note when talking about whether riders are employees or contractors that the minimum pay for a contractor is 164% of the relevant minimum which would apply if they were an employee. It’ll be a sad day for pro cycling if/when the only sponsorship money to be found comes from pluto/autocrats or oligarchs with cubic money to burn. Belgium is a small, and by Northern European standards, not very wealthy country and QS is already stacked with talent. Why is that a surprise?